If yesterday's challenging 19 mile (6,000 ft vert) run on the PK Pass to Johnstone Pass loop in the Pioneer Mountains was anything, it was comic. So what better way to do it justice than with...a comic? 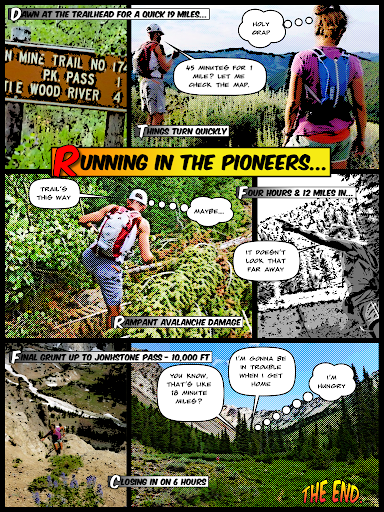 Below is Volume 1; Issue 1 of Running in the Pioneers. That is awesome! I haven't had a comical run in a couple of years, but I know the type. Really glad to have you posting more lately. Especially loved the last post before this one. Seems like the running is really coming along. Hope so. That's great. Was thinking the same thing as I was lost in the swamp at the base of Hope Pass on Sunday... "I gotta get home or my wife is gonna KILL ME!" @Stacy, thanks very much. Running's been pretty good this summer. I've had to keep the throttle in check - which is tough in the high season - but the pay off has been some great backcountry trips. Hope you've been able to get out as well. @Patrick. Exactly. When the actual run time and estimated run time differ by 30 percent or more, there can be trouble brewing at home.